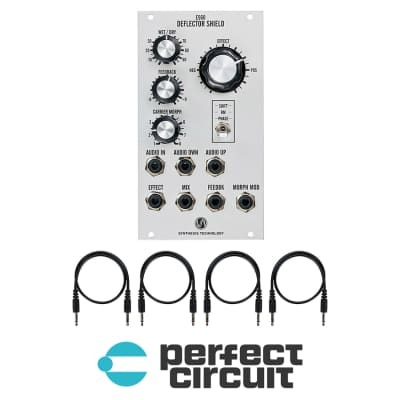 A frequency shifter that can shift thru-zero with 2 simultaneous outputs (down and up). like traditional frequency shifters, a sine carrier will generate a smooth shift but the e560’s 7 other waves will generate a vast array of harmonic content and even patterns of evolving timbral shift. A standard ring modulator (4-quadrant multiplying vca) with a twist: the 2 outputs are always forced into quadrature (90 degree phase shift). The 8 carriers can produce everything from tremolo effects to gating to high degrees of distortion. This is an e560 exclusive mode. the audio input is applied to an 8-stage all-pass network. the 2 audio outputs are in quadrature, but in turn phase shifted from 0 to 360 degrees relative to the input. not only that, the ‘vector' the phase shift follows is the data in the carrier wavetable. The phase shifting can be linear (saw wave), traditional (triangle) or bouncing all over the place (64-random phase waveform). introduces peaking at certain harmonics or cancellation of those harmonics. applying a slow lfo to the feedback cv can produce a wide range of constantly changing spectral content. at once by applying 4 cvs.